Our vacation destination called for us to travel through The Great Smokey Mountains National Park. I must say I was really excited to go through here. I know I traveled through it at some point on a family vacation when I was younger but I really have no recollection of it at all. So I count this as my first national park visit ever! It was certainly my kids’ first trip to a national park and what a wonderful park to visit. The time of year was great though I know we did get to see nearly any of the bright beautiful colors of fall. The trees were still in there empty stage with very few having any spring color to them. Just bare branches mixed in with the evergreens a few red and orange-colored trees. It was breathtaking none the less. Our vacation route was mainly 441 from Georgia into Tennessee. As stated in Vacation part 1, we stopped at Black Rock Mountain State Park in Rabun County, Georgia. 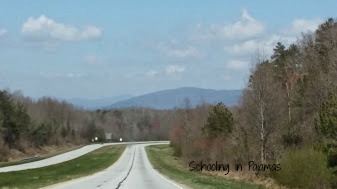 It was not long after that we saw our first glimpse of the Smokey Mountains. 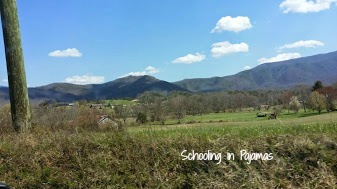 This is just one of the pictures I took as we approached the Smokey Mountains and the National Park. I just had to take a picture of the sign. Our excitement was building. I would highly recommend you check the park’s website before and during your trip often. Part of the area we had to drive through gets closed during certain weather and some close during certain hours.Great Smoky Mountains National Park is open 24 hours a day, 365 days a year. However some secondary roads, campgrounds, and other visitor facilities close in winter. You can also download maps from the website and there is also an app you put on your phone. I have it and it was useful when having the large map out was not a good idea. You download the National Parks app then find the park you want. Click on it and it will ask to download the map. Download it and you don’t have to use your mobile data since it downloads to your phone. It does come in handy because your cell service will go out. 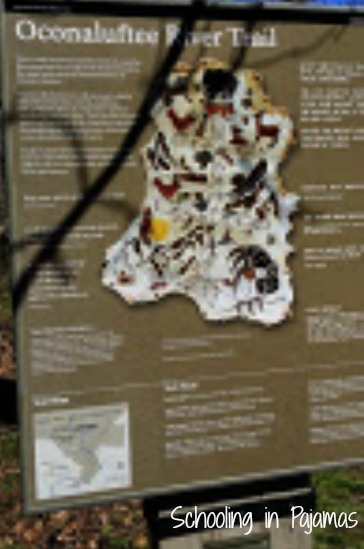 The app also has other info about the park you are visiting. It’s FREE so go get it! If you are going through on your way to a different destination, I would suggest checking to see what is your area of travel. There are some great little spots to stop and look and of course the Visitor Centers are always a must to stop at. Entrance to Great Smoky Mountains National Park is free. The park is one of the few national parks where no entrance fees are charged. Tip: Remember the elevations change drastically in some places meaning the temperature as well as general weather can be totally different. The website says temperatures can vary from 10-20 degrees. 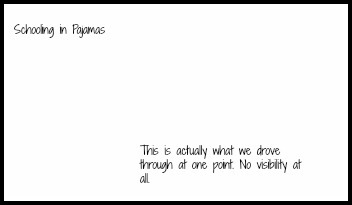 This is so true as you will see a bit further in the post. 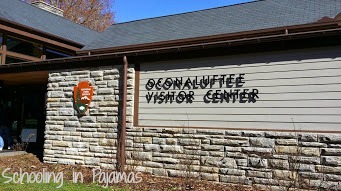 Our first trip through the park found us at the Oconaluftee Visitor Center. I enjoyed this visitor center for several reasons. Compared to some visitor centers, it was large. It had displays about the park as well as the mountains in general. There were several large 3D maps, interactive displays, a small indoor museum about life in the mountains and a decent sized store. Prepare yourself though, many maps and brochures cost about $1-2 to get. This is for all over the park though you can get a park map brochure for free. There is a Mountain Farm Museum next to the visitor center that you can walk through as well as some trails and the river is right next to it. There are clean restrooms and vending machines. While were there, there were 3 or 4 chickens running around. Several would go right up to people but none were bothersome though. 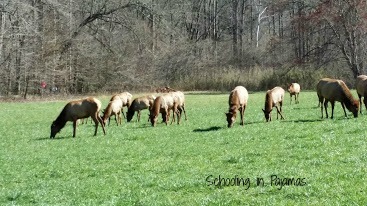 We were also lucky to see a herd of Elk while we were stopped. You could almost walk right up them but please use common sense. While this is a great photo opportunity, remember they are still wild animals. Give them their space please. January – February 8:00 a.m. – 4:30 p.m.
March 8:00 a.m. – 5:00 p.m.
April – May 8:00 a.m. – 6:00 p.m.
June – August 8:00 a.m. – 7:30 p.m.
September – October 8:00 a.m. – 6:30 p.m.
November 8:00 a.m. – 5:00 p.m.
December 8:00 a.m. – 4:30 p.m.
Driving through the park was such a wonderful sight. We did not have time to stop anywhere else due to needing to be at the condo by a certain time. I was able to take some pictures as we drove. We were shocked to see snow still on the ground in some spots especially with it being in the mid 50s outside. The kids were thrilled to go through so many tunnels while driving. Most were short but we did go through one that was long and somewhat dark. 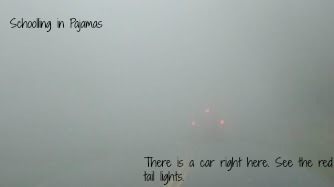 You really needed your lights on even if the signs didn’t tell you to. it seemed everyone just had to honk their horns and it became extremely loud in the tunnel. I for one was glad to get out of the tunnel. 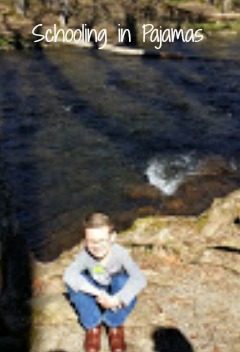 Our second day on vacation we visited Cades Cove in the national park. It was an hour drive from where we were staying but we had heard so much about it that we wanted to see for ourselves. Here is some info on the area. 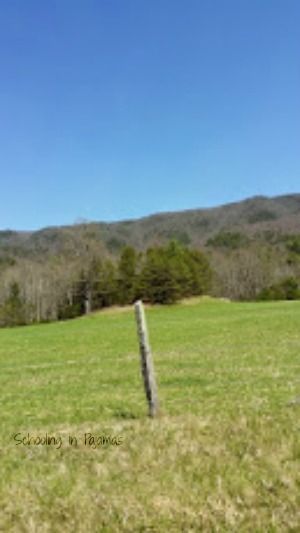 Cades Cove is a broad, verdant valley surrounded by mountains and is one of the most popular destinations in the Great Smokies. An 11-mile, one-way loop road circles the cove, offering motorists the opportunity to sight see at a leisurely pace. Allow at least two to four hours to tour Cades Cove. Large numbers of white-tailed deer are frequently seen, and sightings of black bear, coyote, ground hog, turkey, raccoon, skunk, and other animals are also possible. Scattered along the loop road are three churches, a working grist mill, barns, log houses, and many other faithfully restored eighteenth and nineteenth century structures. We didn’t take any time to hike around any of the structures because we got there way later than we wanted to. It was packed with cars and people even though it was still considered the off-season. The animals are mostly out in the early morning and early evening hours but we were there right around noon. I also think the amount of people running around the fields did not help either. 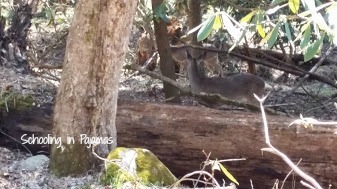 We say a deer by the road and some in the woods right off the road but that was it with our animal encounters. 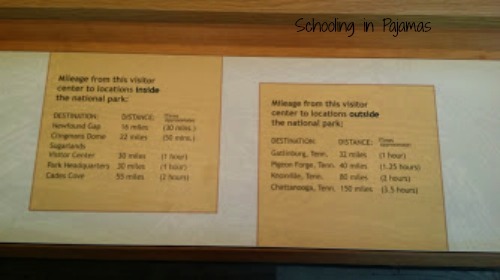 The kids were disappointed and made it abundantly clear to their dad whose idea it was to visit Cades Cove. He made it up to them by stopping at the Visitor Center and buying them ice cream. Who wouldn’t get happy with ice cream, right? I took this picture for the trees. There was a small raised area with evergreens in the middle. To the side of the evergreens there was a tree with bare branches. It was tall and without leaves it could have been a spooky tree in some movies. It’s hard to see in the picture but even so, the area is pretty. On our way home we had to pass through the park again. 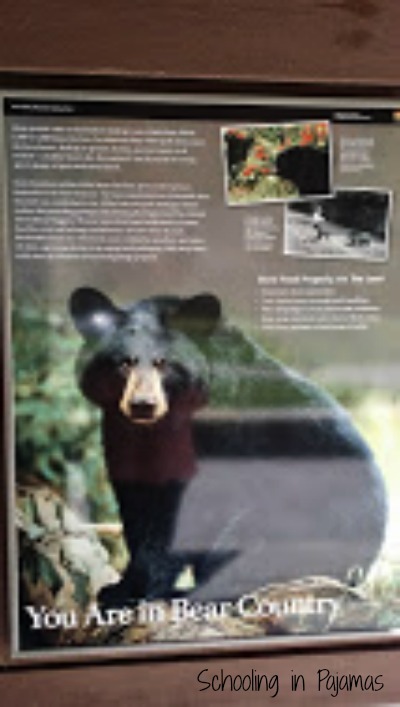 This time we stopped at Sugarlands Visitor Center and Clingman’s Dome. 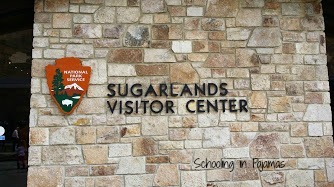 First let’s talk about Sugarlands Visitor Center. This is a smaller visitor center not far into the park after leaving Gatlinburg. 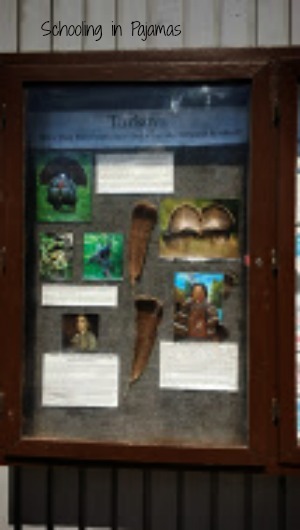 It has a small shop and some exhibits. It can be very crowded due to its small size and the parking can be a nightmare when they are extremely busy. Next we went to Clingman’s Dome. This is where you need to beware of the weather and temperature changes. 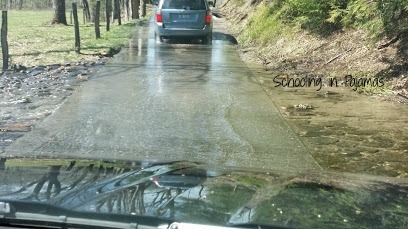 We started at 56 degrees before turning onto the road up. By the time we hit the top, the temperature had gone down to 31 degrees. It went from partly cloudy to I can’t see a thing in no time. It’s all about elevation. This was a starting picture. It’s cloudy but still clear as far as you can see. 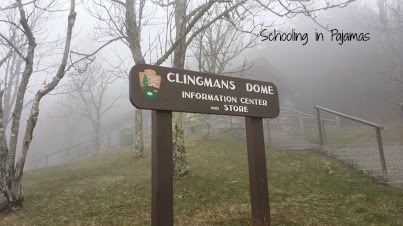 It was so cold, windy, and wet when we got to the parking lot for Clingmans Dome. We were scrambling to find jackets and long sleeve shirts. Other people were putting on winter parkas and gloves because it was so cold. Lot’s of girls had on shorts and they were freezing. I had on capris and sandles and was freezing myself. We started out on the trail but decided it after seeing the sign saying it was a 30 minute walk up and 30 back that we would not put my 7-year-old through it. Instead we went to the store to warm up before walking back to the truck. We went but didn’t see it but hey we were there so I’m counting it. As with our other visits to State Parks, we couldn’t pass up buying our National Park patches. We’re gonna see how many we can collect so we have lots of plans over the next few years. 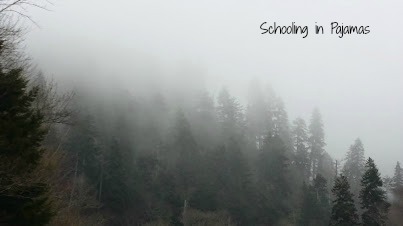 I hope you enjoyed this post and it helps you in some way planning your own trip through the Smoky Mountains. 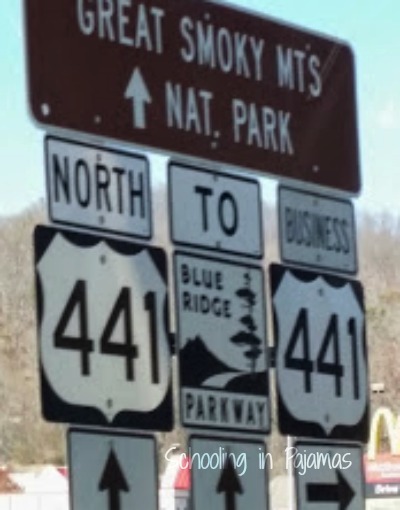 We enjoyed our ride on 441 North and through the Great Smoky Mountain National Park. 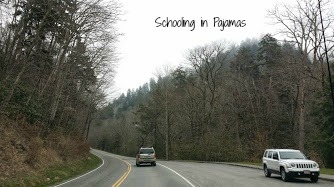 Share your road trip memories through the Smoky Mountains.